White Noise: Benefit or Bane? White noise is in the ears of the beholder. Some people put a fan on in order to sleep, or they go out and buy a white noise machine. Unfortunately, according to some people, some white noise isn’t so “white.” It doesn’t stay in the background. The perception of the noise from the turbines might be because people find them an eyesore on the skyline. The effect of the sounds coming from wind turbines has been studied extensively. Because the issue can be so contentious, it’s hard to trust the conclusions one way or another. Some studies conclude turbines don’t do anything to harm sleep. Other studies and people who live near them claim otherwise. It’s hard to tell who’s telling the truth, who’s lying, or who is suffering from a skewed perception. Videos readily available on YouTube have a soundtrack of this awful, whirring repetitive noise. Yet we who don’t live anywhere near the turbines shouldn’t accept it as proof in and of itself. Videos can easily be doctored. Many of us have stood near wind turbines. Many have said they don’t hear a thing. Others do hear something. If you don’t hear anything it could be because the day doesn’t have enough blowing wind to make the turbine make any noise. On the other hand, it could be that some people aren’t sensitive enough to the noise due to some aspect of their physiology. It also could be that the turbines are so ugly to some people they’re going to manufacture complaints. Yet renewable energy is important. Beyond global warming, from a national perspective, a diverse energy supply makes strategic sense. Still, ruined sleep from wind farms can be construed by rural residents as another thing shoved down their throats by oppressive city dwellers. Every place has its advantages and disadvantages. City dwellers would have their complaints about the sound of traffic and the other noises that accompany living close to other people. More than one urban resident has visited a relative who lives in the country and found they couldn’t sleep with the silence, the crickets, or croaking frogs. The country cousin has gone into the city and wondered to himself, don’t people here ever stop driving around? That especially happens in downtown Manhattan. It truly is the city that never sleeps. Yet all repetitive noises aren’t bad for sleep. You have ceiling fans and other fans that sit on dressers. They send a continual breeze around the bedroom. When they want the noise without the breeze (and let’s face it — a constant cold breeze can be miserable at certain times of the year or if the air conditioner is turned down too low) they go out and purchase white noise machines. The noise machines are good for babies, for people who want to drown out a snoring spouse, for people who have apartments with thin walls or even old dogs that bark randomly during the middle of the night. Product reviews are full of people singing their praises. A dedicated white noise machine can give you the flexibility that you don’t get from a fan. The fan, however, can be pointed toward a wall. The wall will dissipate the breeze from the device. Both devices are great for people who work the night shift. Everybody else is awake during the day. There’s noise from time to time. It helps friends and family not have to encounter the disturbed bear. While the machines don’t exactly drown out the noise intrusions, they do compliment them. They aurally color the sounds allowing the individual to sleep undisturbed. Hospital critical care units especially can be full of these random, disruptive noises. A 2016 study by some Iranian academics showed that a white noise machine can be especially helpful for drowning out those noises, helping those patients sleep better. With all of the beeps and chirps on critical care equipment, there’s a lot of noise to drown out. Sometimes after months of a functioning part of the machine loosens and it starts making a disconcerting racket. Then the machine must be tightened or lubricated. Be sure to save those instructions! A fan can be helpful for sleeping, ceiling or dresser top, too. This can be part of your arsenal for ensuring you get a good night’s sleep. Beyond that, remember that it’s how you react to your environment that shapes your feelings. If you hate wind turbines, be sure you’re separating the way you feel about how they look from the actual sound they make. Have you ever experienced trying to sleep near an operating wind turbine? Do you sleep with a fan or a noise machine? What do you think about it? Comment below. Afshar, P. F., Bahramnezhad, F., Asgari, P., & Shiri, M. (2016). Effect of White Noise on Sleep in Patients Admitted to Coronary Care. Journal of Caring Science, 5(2), 103–109. Lane, J. D., Bigelow, P. L., Majowicz, S. E., & McColl, R. S. (2016). 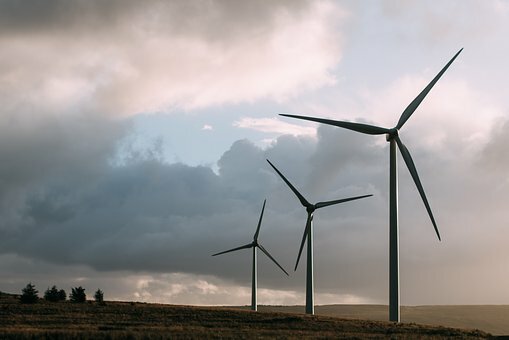 Impacts of Industrial Wind Turbine Noise on Sleep Quality: Results From a Field Study of Rural Residents in Ontario, Canada. Journal of Environmental Health, 79(1), 8–12. The Dream Recovery System uses affiliate links in some places. We receive a small commission for products purchased through these links.